It's finally happened. One of the four major North American sports has caved in to the potential $100 million in revenue to be made by allowing an advertising patch on its league uniforms. The NBA Board of Governors voted to allow a patch on the uniform for the start of the 2013-14 season, and the same patch will appear on the team's uniform sold at retail locations. No surprise that the NBA has taken the commercial leap, its funding keeps the WNBA afloat, and that league has been wearing advertising in its uniforms since 2009. Authentic Store Buzz: A great turnout yesterday at the store to talk soccer and meet and greet Philadelphia Atoms 1973 championship goalie Bob Rigby, now a TV broadcaster with the MLS Philadelphia Union. Bob was the first soccer player to appear on the cover of Sports Illustrated in 1973, and quite a few folks had the issue with them to be signed (pictured above). Asked how many of the covers he has signed in nearly 40 years, Rigby chuckled and simply said too many to count. Stay tuned for word on an exciting August in-store event coming in a couple of weeks. Authentically Speaking Trivia Time: Name the last NFL team to wear its white jerseys for an entire regular season (pre-season games don’t count)? Answer on Monday. 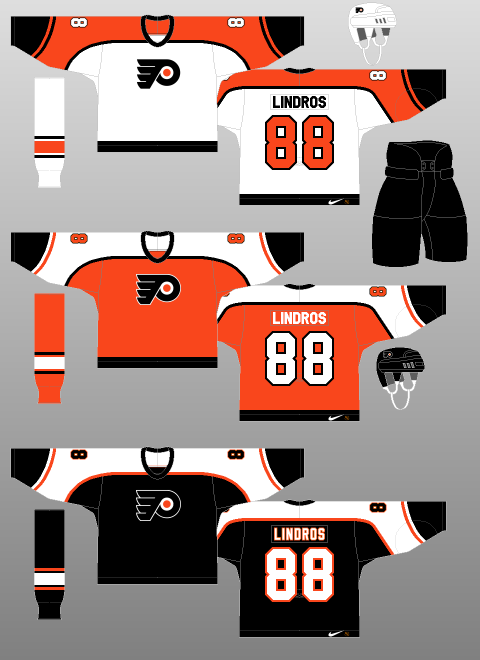 Thursday’s answer: The Flyers first introduced a black jersey to their wardrobe in the 1997-98 season.